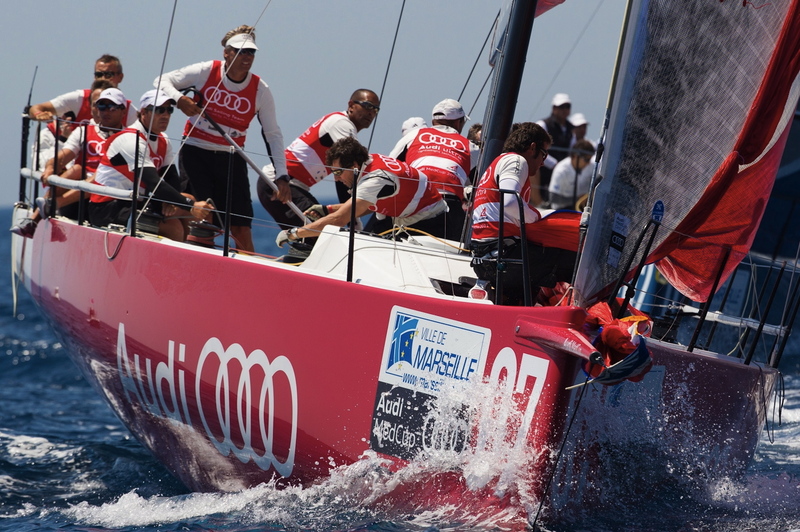 Light winds again on the second racing day of the Audi MedCup Circuit’s Marseille Trophy. The 52 Series fleet raced on Marseille’s two main race arenas: the first the Rade Nord in a light and fitful sub 10 knot sou'easterly breeze and the second on the Rade Sud in a 9-13 knot southerly. Quantum Racing rode the rollercoaster today after a win in the first race they plummeted to eighth in the second thanks to a late start off the line and picking the wrong side of the course on the first crucial beat. Synergy sit one point behind the Americans with a seventh and a second for the day, while RAN was most consistent with a second and a fourth. 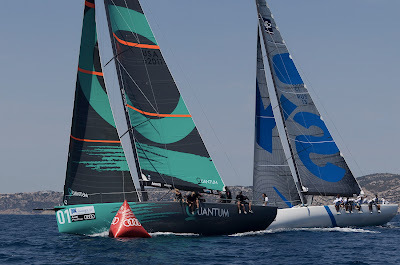 Quantum’s strong start was key to winning the first race, where they dominated from the first beat. 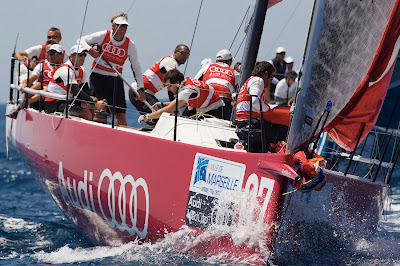 RAN's pin end start and prudent tactics in the best pressure allowed them to stay well clear of Audi Azzurra Sailing Team. 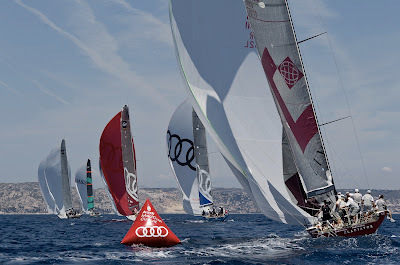 There was drama further back when Audi All4ONE blew their kite at the final hoist while Synergy copped two penalty turns for fouling Gladiator at the windward mark. 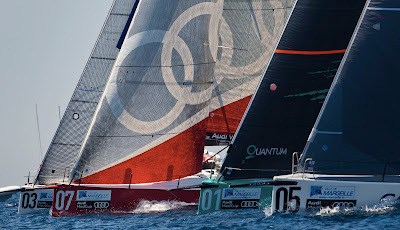 In the second race on the Rade Sud course the breeze built offshore, to the right and All4ONE took advantage. For the next two legs the Franco-German crew lead by Jochen Schuemann looked the goods for their first win here, but the late afternoon breeze had other ideas and dropped on the right of the run. 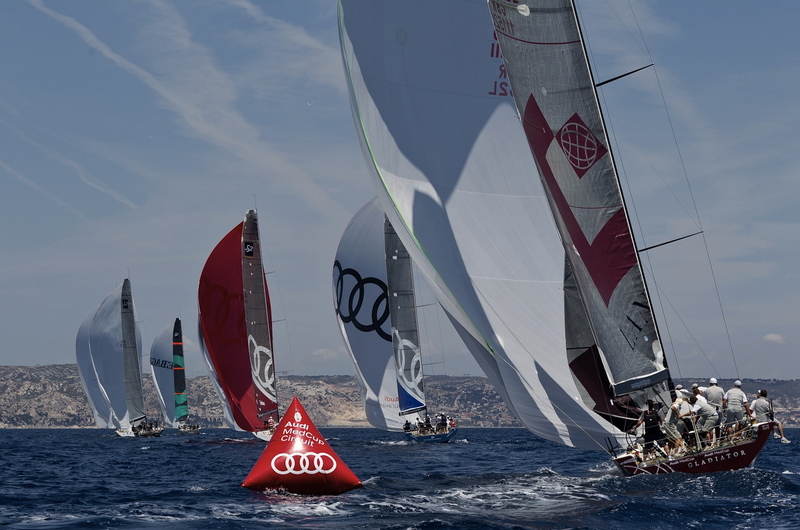 Chris Main, Gladiator’s tactician made the early call to work offshore and the British crew were rewarded with steady gains, able to finally gybe inside Synergy to win their first race on the Audi MedCup Circuit, on only their second day racing.